NGC6822 is a galaxy located in the constellation Sagittarius and it is 1.6 million light-years from Earth. This galaxy belongs to a local group of galaxies together with Andromeda, Triangulum Galaxy and Milky Way. This galaxy is quite famous, because Edwin Hubble discovered several variable stars in this galaxy. These variable stars can be used for determination of the distance from Earth. 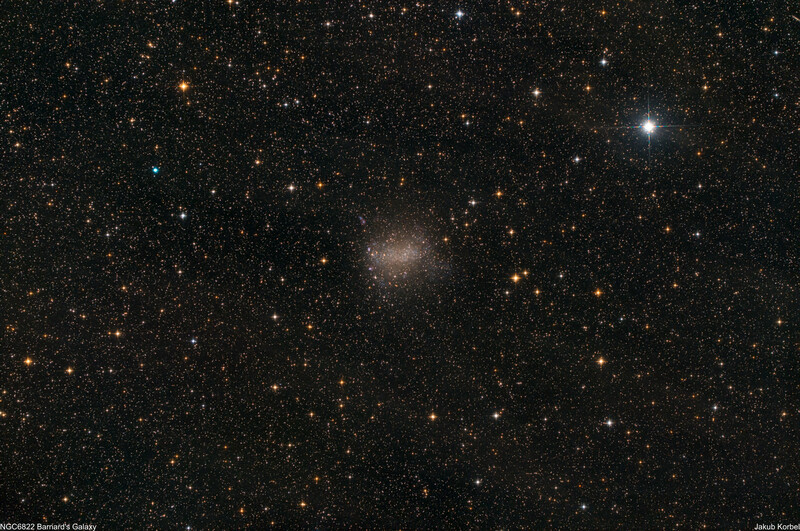 Barnard’s Galaxy was the first galaxy with accurately determined distance. Barnard’s Galaxy is very dim deep space object; therefore I dedicated quite long integration time to it (180 minute) and I chose long exposure time to each frame (300 seconds). Several nebulae are visible on the picture. These are the red spots located at the left side of the galaxy. They are called Bubble Nebula and Ring Nebula and are giant HII regions, where new stars are born.